Anyone who has seen The Speakmans will get that they are great at what they do. They are fab on TV too but are they as good as they seem? Well, I recently attended an event of theirs in Elstree, Hertfordshire; ‘How to be happy in 2017’. I was basically going along as a nosey therapist to see what they do, how they do it, see how their techniques differ from mine and learn some new tips. (It’s always good to keep learning.) The event was aimed at the general public, those who have something they want to change. It’s not aimed at therapists though they were fully aware that they are always some at their seminars. Nik and Eva Speakman were so lovely and friendly to everyone, so very humble and genuine towards each and every person they spoke to. They took time during the day, that ran from 9 until 5.30, at every break to talk to the attendees. There were people queuing, in any free time, for their autographs, photos and to have their help with their issue and Nik and Eva took their time to be there for everyone. Even at the end they were still there helping attendees. We squeezed a photo in, here’s a colleague, hypnotherapist Heather Bond from Potters Bar, with Nik, Eva and me. Some people at the seminar clearly had big difficulties and issues in their lives and even just listening to Nik and Eva’s own life troubles must have been a inspiration in terms of how things can be transformed. The fact they showed their own vulnerability was a way of connecting with their audience and creating a warmth and rapport within the room; they are actually normal people, with real personal success refusing to be defined by their pasts. They were candid about their family and their lives and that was endearing. 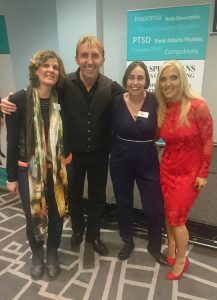 The day had emotional moments and I was surprised how emotional I felt listening to The Speakmans and their attendees’ stories. I am able to separate myself from my clients’ issues as a hypnotherapist. It is an essential part of the job. The seminar included various topics along with phobias and phobic responses, PTSD, OCD, lack of self esteem, labelling and over use of medication for mental health in 21st Century. The ‘medication bit’ for me was really interesting. I agreed that, mostly, the use of medicating mental health issues doesn’t resolve the root cause but instead works on removing the symptoms. I find that in my private practice I see many people who are on medication but don’t want to be or feel that when they have reduced or come off it the symptoms return – I can’t imagine why? (Sarcasm alert!). If you have a broken bone and you take a painkiller the pain may go away, or it might not, or you might have some new symptoms that might need to be treated to ( maybe from the medication or maybe as a side effect of not treating the broken bone). Ultimately if you stop the painkillers the bone won’t be better. Hmmm! Resolve the cause of the issue and remove the symptoms. The real examples of helping people live included Nik and Eva’s intuitive questioning. They used NLP (Neuro Lingustic Programming) and some hypnotic techniques. One great example of what they helped on the day was one woman’s snake phobia. Since visiting a dark reptile house as a toddler the phobia had been present for what was probably around 40 years. It transpired it had originated as a phobia of the dark which had mutated. She had never considered the dark tunnel as being the issue but instead was blaming the snake for her having been scared. You could visibly see the relief in the woman when she realised that snakes are fine. So, if you have the opportunity to see The Speakmans in action do go. And, if you have a particular issue you want to resolve find a therapist. As all TV therapists, they have a very long waiting list but I’d recommend hypnotherapy, of course, which can help many issues. Ring around and find someone qualified and insured. Look at a professional hypnotherapy body such as the General Hypnotherapy Register (GHR). And, importantly, someone you feel comfortable with, someone you trust. You can relieve yourself of the past to live your life more positively today. Contact Amy Brown for more information about her Hypnotherapy services.